Swansea City manager Garry Monk has declared his delight at halting a five-match winless run with a 2-0 victory over Leicester City. The Welsh club had not picked up maximum points since opening the Premier League season with three successive successes, but two goals from Wilfried Bony were enough to see them return to winning ways on Saturday. And Monk says work done on the training ground is beginning to bear fruit. “I’m very pleased with the first half, we played very well and moved the ball very well,” he told Sky Sports. “Some of the movements and patterns we’ve done in training came off. 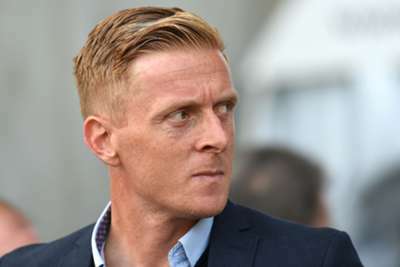 But Monk insists he never doubted the performance level of his players, claiming Swansea should have had a greater return from their last five fixtures. “The five games which we haven’t won, we played very well and deserved more than what we got,” he added. Swansea now face a tricky run of fixtures, visiting Liverpool in the League Cup before facing Everton, Arsenal and Manchester City in the top flight.